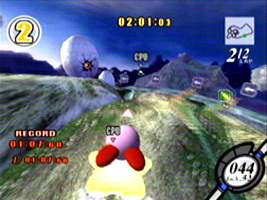 A Warp Star racing game across Dream Land starring Kirby. Your Warp Star automatically accelerates, so you only have to steer and boost around the tracks. As well as the main racing game, there's a top-down racing game, and a City Trial mode, where you have to power up your star to take part in a series of minigames. Instead of winning cups, each game mode has over 100 challenges that you have to complete, unlocking new Warp Stars, playable characters and events. As you complete them, the criteria for more challenges become visible. As in previous games, the Sword Ability gives Kirby a green hat and a blue-hilted sword, based on Link from The Legend of Zelda series. As in Kirby: Nightmare in Dreamland, the Freeze Ability gives Kirby a blue parka, which he first wore when using his Copy Ability on the Ice Climbers in Super Smash Bros. Melee.